Everyone knows that disco is freaking awesome. Everyone also knows that disco shoes are freaking awesome. And? That Michael Kors is freaking awesome. What happens when you combine these elements into a shoe-making pot? 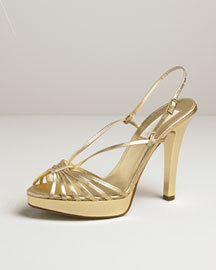 Why, it's the Michael Kors Disco platform sandal! Ce n'est-pas le freak mais totalement le chic! Seriously freakin' awesome!!! I know though that I would come over all 'Golden Girls fight with Cruella' and have to wear these with thick brown tights, fur coat, and fag in cigarette holder. I'm a disco granny! Ooh! Pretty butterfly necklace thing!